Decide whether you want to put your fountain indoors or outdoors. 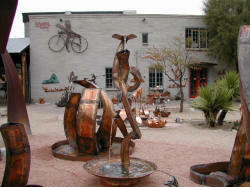 In general indoor applications require fountains that are designed to minimize splash out and sound. Fountains that create a gentle water flow from leaf to leaf make just enough sound so that you know they are there, but not so much that they become get overwhelming. Models of this type include: Rose, Single Stem Leaf, Waterfall with Bloom, and Eucalyptus. These models are fine outside, also. I offer some other designs that have greater water flow and sound, but don't have much splash out. They, too are good indoors or outdoors. They include: Prairie Fountains, Columns, some Arcs, and some Agaves. Outdoor applications can tolerate more splash and sound. That's why Yuccas, Saguaros, Taller Agaves, Prickly Pears, Iris, Cattails, Calla and Day Lilies, Birds of Paradise, Big Leaf, Rain, and some Arcs are well-suited for outdoors where you REALLY want to see and hear them. For the most part, these models are not recommended for indoor use. Fountain style is also an important factor. You should select something that complements your decor or landscaping - not something that competes with it. Other considerations are size and display. 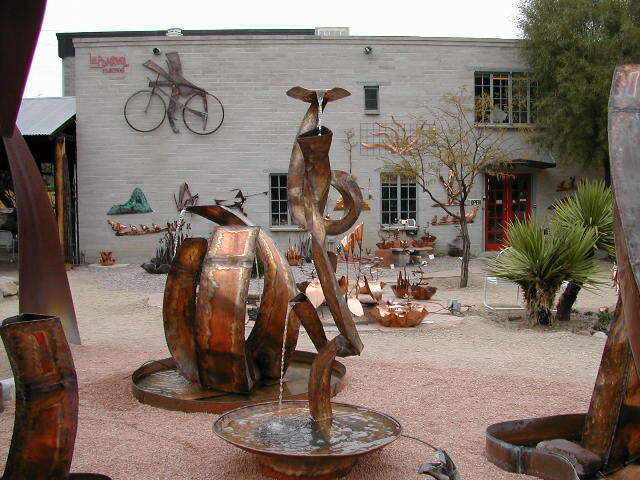 Your fountain should be appropriately sized for the space. Too large a fountain in a small space doesn't do anything justice. Neither does too small a fountain in a large space. When in doubt, put something of a similar size in the space you are considering and live with it for a few days. If you still want more advice, email me.